small white pill appeared in nightclubs and at music festivals. It looked like Ecstasy, but as the £10 price tag hinted, it was something else: 2C-I, a newer and more potent hallucinogen. Psychonauts (early adopters, in square-speak) quickly seized on the drug, and others are expected to follow. In October, the National Criminal Intelligence Service alerted police forces to a rising threat. Perhaps more significantly, Mixmag, a clubbers' magazine, pronounced 2C-I “a national mash-up waiting to happen”. The timing is certainly fortuitous. Boredom and rising tolerance have done for Ecstasy, the 1990s club drug of choice, what stern warnings could not do. Last week, a Home Office survey found that only 2.6% of 16 to 24-year-olds had used it in the past month; a year ago, 3.6% had. 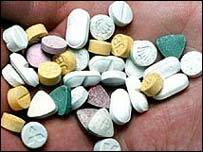 Worse, from the dealers' point of view, prices of Ecstasy tablets have fallen from more than £20 in the late 1980s to £4 or less today. Profit margins have shrunk to as little as a pound a pill, which hardly justifies the opprobrium and long prison sentences that go with the trade. Mat Southwell, of the Dance Drugs Alliance, a hedonists' advocacy group, says that many dealers now see Ecstasy as a means of keeping customers, nothing more. Some have begun to push cocaine, although that is a paraphernalia-filled business unsuited to the club market. Dealers would prefer something that is both easy to take and profitable, which is where the new pills come in. In some ways, the drug market would seem to favour new entrants like 2C-I. Manufacturing know-how is widely available, thanks in part to a Californian chemist, Alexander Shulgin, who puts new recipes into the public domain, together with tasting notes (“my conversations were incredibly clear and insightful,” he says of his 2C-I experiment). Fierce competition among producers, importers and dealers means that products can be brought to market cheaply. And there are armies of early adopters to spread the word. The problem, as with all illicit products, is quality control. When Ecstasy first appeared, it was branded with symbols which inspired some trust. But factories soon began putting the same symbols on amphetamines and caffeine tablets. Pill-poppers have responded to this problem partly by putting faith in dealers (not always a reliable source of information), and partly by lowering expectations. James Fitchett, a Nottingham marketing expert, says that teenage Ecstasy users will sooner concoct personal explanations for bad experiences than blame a beloved product. All of which explains why new drugs are slow to catch on, and slow to be discarded. The successful ones are valued not so much for their chemical properties, but for their associations with new ways of going out. For a new product to succeed, it will need amenable venues, distinctive fashions, and new music—preferably stuff that outsiders find intolerable. A potent and hallucinogenic new variant of the drug ecstacy is being sold in clubs across the country, police forces have been warned. In response to the threat from the substance, called 2C-i, the National Criminal Intelligence Service has issued an assessment of the dangers of the drug to police forces. white pills, which are marked with an "i", were seized in nine separate hauls. The largest seizure of 65 tablets was at this summer's Glastonbury festival. The pills were also were found in Brighton, Wales, Bedfordshire and Edinburgh. They are believed to have been smuggled in from Europe - possibly from Denmark. The drug may appeal to dealers because - unlike tabs of ecstacy, which can now sell for as little as £1 each - 2C-i pills can fetch up to £10 each. Possession of the Class-A drug can mean seven years in jail whilst dealers could face a life sentence. A police source told the Press Association: "According to people who have taken it, it's very strong and very powerful. "If someone unwittingly takes this drug to go clubbing and then starts hallucinating and thinking they can fly then, obviously, that could end badly." Experimenting with such drugs is always risky, an NCIS source warned clubbers. "People who become involved in synthetic drugs risk their health simply because there is no regulation of how the drugs are manufactured. "Users may not be aware of the side-effects of commonly-used ecstasy variants with potentially tragic consequences." Though the drug is currently believed to be smuggled in from abroad, the police source indicated it could be domestically manufactured. "The chemicals to make this are available and it can be made pretty much anywhere."